Landscape lighting in the NJ tri-state area can add beauty to your home at night by illuminating some of the key features your property has to offer. We design and install state-of-the-art, low-voltage lighting systems that beautifully highlight your home and property while extending your evening enjoyment and increasing safety and security. The team at Thomas Flint will take into account all the features of your architectural elements and landscape when we create a lighting plan. We focus on enhancing the key features of your property while at the same time consider any safety aspects such as elevation changes. We use low-voltage lighting in the NJ tri-state area, which is safe, cost effective, and produces a soft, elegant light. Our fixtures are made to blend subtly into your landscape. Our philosophy is to not see the source of light but see the effect the light creates. We may use up-lighting or directional lighting to highlight points of interest, or in some cases, down-lighting from nearby trees to light a driveway or walkway effectively at night. Ambient light can be created around the home and plantings to add drama and dimension to the yard. If you would like to maximize the time you can spend enjoying your property after dark, contact Thomas Flint Landscape Design today. We’ll come to homes in the NJ tri-state area to give you a custom estimate based on your landscape and lighting needs. 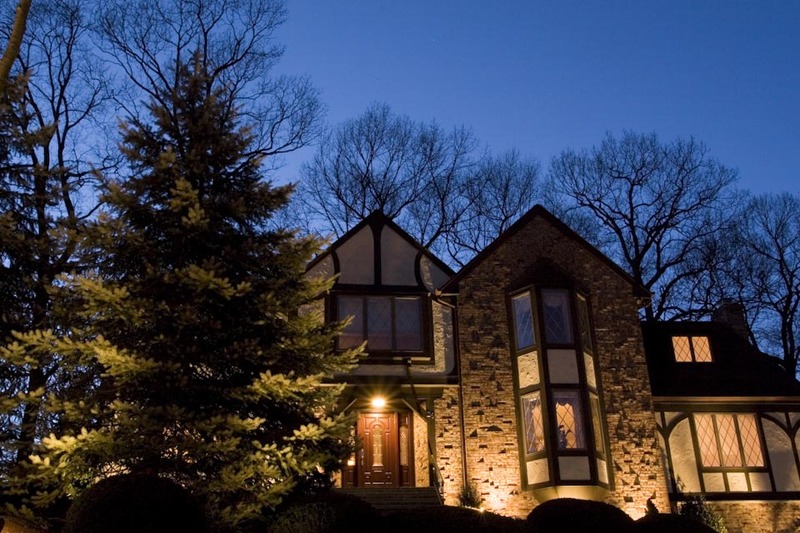 View all our landscape lighting in the New Jersey tri-state area in our portfolio. Thomas Flint Landscape Design & Development is a Ramsey, New Jersey landscape company that specializes in landscape design, planting, outdoor lighting, paver patios and walkways, outdoor fireplaces, custom swimming pools, pool renovations, and more for people in the New Jersey tri-state area, including New York and Connecticut.